Are you looking at getting braces but you’re nervous? You aren’t alone. 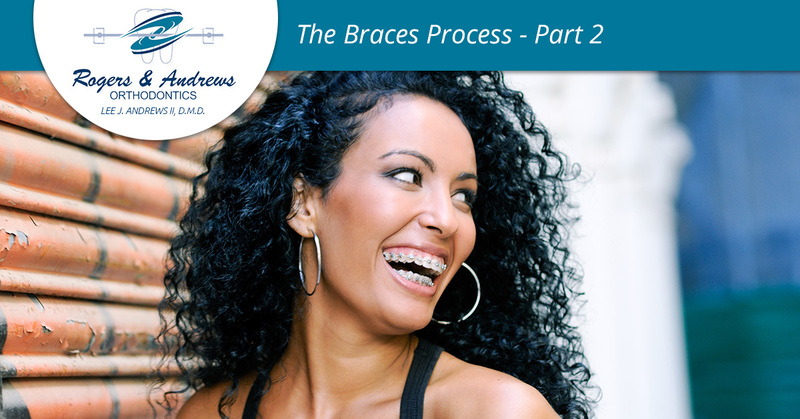 People of all ages get braces, and many times, they aren’t sure what to expect and their knowledge is second-hand. The good news is, you have a very knowledgeable source in Rogers & Andrews Orthodontics! In our last blog, we shared some general information on how the process begins, including consultation and gathering information. Today, we move forward into getting braces and beyond! This is the big visit, second only to the appointment where you get your braces off! We want to get things right, so this appointment will usually take around two hours. We will not only get the braces in place, we’ll also discuss how to care for them and keep them clean. We want you to leave feeling equipped and confident! Depending on what we’re working to achieve with your treatment, you can be in braces for a wide variety of times. Some people have braces for six months and others have them for three years. You will likely fall into a rhythm of monthly adjustments. Setting adjustments a month apart gives your mouth time to get used to them while ensuring the treatment doesn’t stretch out too long. The ultimate goal is to get you out of the braces, after all! During this time, we will do everything we can to ensure that wires don’t poke you and you’re as comfortable as possible. Brackets can pop off during treatment, and while we all hope they won’t, we can quickly and easily fix the issue. This is usually the most exciting appointment for our patients! Our team gets excited too, because there’s nothing like seeing how patience and hard work pay off. In this appointment, we will remove the braces in a process that usually takes about an hour. We may take more x-rays, but chances are good we will focus on fitting you for a retainer. We may give you a temporary retainer until we can create your official one. Lastly, we will probably ask you for a picture showing off your brand new smile! After the appointment, you can get used to the feeling of your teeth without braces by eating the foods you had to avoid while you had braces! Orthodontic treatment often takes a significant amount of time, not to mention a large investment. The dental benefits make treatment well worth it, but they can be lost if you don’t take the necessary steps to preserve all that hard work. Our orthodontist team is here to help you keep the benefits of your orthodontic treatment for years to come. Typically, you’ll be fitted for a retainer in the same appointment you get your braces removed. Once we have your retainer ready, we’ll call you in for a fitting. After that, we will likely schedule a few retention appointments to ensure that everything is going well. When you contact us in Augusta, we will do everything possible to make you comfortable and deliver the results you want. Contact us today!